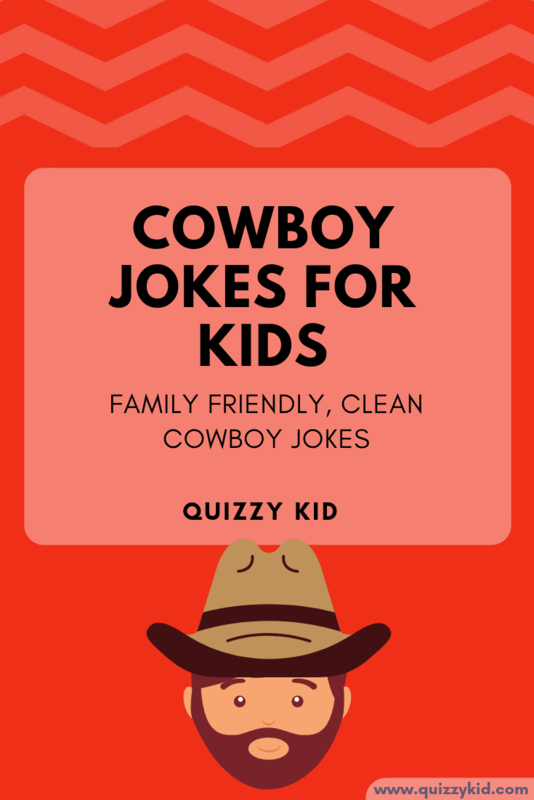 Family-friendly, funny cowboy jokes for kids. Chuckle along to these cowboy puns and share them with your friends! Q1. What did the cowboy say to the pencil? Q2. Why did the cowboy ride his horse? Q3. How did the cowboy ride into town on Friday & ride away only three days later on Friday? Q4. Why did the cowboy thief take a bath before every stickup? He wanted to make a clean getaway! Q5. What do they call cowboy Santa? Q6. Why did the cowboy get so many laughs? Because he was always horsing around! Q7. Where do cowboys cook their meals? Q8. What is as big as a cowboy but weighs nothing? Q9. Why are cowboys bad at math? Because they're always rounding things up! Q10. Knock Knock. Who's there? Ya. Ya who?